Agreements are made within your company for the organisation of (master) data. Unfortunately, however, these procedural agreements cannot always be enforced within JD Edwards. Potential deviations from the agreements can arise as a result. With the Data Quality Director (DQD), you can rest assured that all data agreements will be monitored. Since this takes place automatically, you can keep your data fully up-to-date in a simple and easy manner, and make sure that any ‘irregularities’ are resolved directly. any issues. In a nutshell, DQD provides you with the assurance of reliably functioning software. DQD is organised so that the properties of all validation reports are registered in the master table, from where audits are started up automatically. This add-on keeps track automatically of when a validation report must be executed, thereby excluding the possibility of forgotten audits. The user determines which tables are checked and which fields are registered in the workbench for every report. Many tables in JD Edwards contain a large quantity of records. It is unnecessary and time-consuming to check all (unchanged) data daily. That is why DQD offers the possibility to audit only that data that has changed since the previous run. On start-up the DQD workbench displays an overview of the number of outstanding issues for every validation report, with the possibility to limit the overview to issues relevant to the requester. These issues can be evaluated and resolved directly from the workbench. In addition to the validation report, DQD also has a repeat audit report. This report can contain an automatic correction option. In this case, the ‘Fix-It’ button can be used to resolve the issue directly. If it turns out that the ‘Fix-It’ functionality offers the right solution every time, it can be applied automatically when identifying issues. In the unlikely event that an issue is wrongly identified, the user can ignore it using the Exceptions function. In addition, all exceptions made contain audit trail data that shows who made the exception and why. These can also be requested as well as deleted from the workbench. Problems can be resolved directly from the workbench since DQD contains flexible exits that can lead to standard (or custom) programmes. There are six flexible exits that can be linked to every validation report. This means that it takes only one click of the mouse to access the required programme and issues can be resolved more quickly with DQD than with standard software. For every exit, the user can indicate whether or not the problem should be revalidated after correction. DQD identifies resolved issues and removes them automatically from the workbench and, if desired, can create an audit trail record. DQD is an add-on for Oracle JD Edwards developed by Cadran. It is the perfect solution for the easy management and accuracy monitoring of procedural agreements for your data. 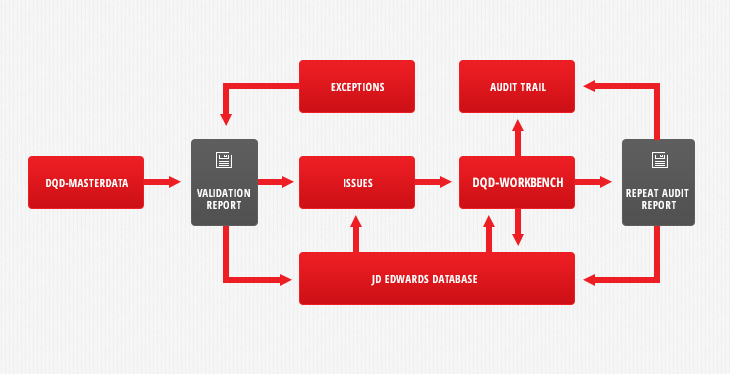 DQD is suitable to prove your auditor that the internal checks have been executed. Our consultants are intimately familiar with the world of JD Edwards. This means they are able to provide professional guidance in implementing the Data Quality Director. Walter Bindels, Logistic Consultant at Cadran, would be happy to talk about the possibilities for your organization.